Waurn Ponds is a rural district, a residential suburb and university precinct 9 km south-west of Geelong. 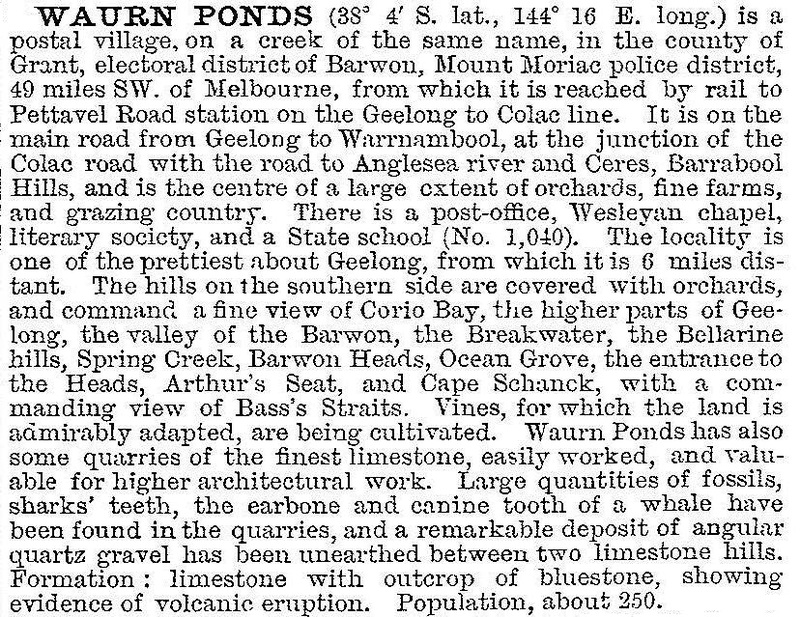 It is named after the Waurn Chain of Ponds, a watercourse which flows from the region of Mt Moriac to the Barwon River, entering the river a short distance below the breakwater which separates the seawater inflow from fresh water. It is thought that the name derives from an Aboriginal word meaning camp, although another authority states that the original name was Warren Chain of Ponds. Waurn Ponds is on the Princes Highway, and there was the Victoria Inn (1845-60) and the Waurn Ponds Inn (1856) about 2 km west of the present suburb. A National School was opened in 1859 and the forerunner of the State primary school was opened in 1870. A well known property in the area was David Pettavel's Albert and Victoria vineyards, begun in 1848. The area was better known as Pettavel in the 1860s, when it was described as having some of the finest scenery in Western Victoria. The European population, however, was small and scattered. A quarry for limestone (building stone) was opened in the 1840s, and produced material for high quality architecture (eg St Mary's Star of the Sea Catholic church, West Melbourne). The quarry also had kilns for making mortar lime, which operated until the 1970s. They are on the Victorian Heritage Register. Another structure on the register is the old Princes Highway bridge over the Waurn Ponds Creek. Built of local limestone in 1868 it has a basalt keystone carrying the Barrabool Shire's crest. Further west there is the public hall and memorial recreation reserve. During the 1970s when a few orchards were still visible at Waurn Ponds the State government began planning for regional universities. The first region chosen was Geelong, and the Gordon Institute of Technology provided the basis for the Deakin University campus at Waurn Ponds in 1977. The Waurn Ponds campus is one of three Deakin campuses, and has residential facilities for about 800 students. Geelong Grammar school has a campus north of the university, along with the private Marcus Oldham Farm Management college. On the opposite (south) side of Princes Highway there is the growing Waurn Ponds suburb, flanked by the Geelong Ring Road. The Waurn Ponds Creek has a linear park, separating the residential part from Waurn Ponds shopping plaza and a hotel/motel. (The Waurn Ponds shopping centre (1985), about 1 km to the east, is in Grovedale.) To the west some small vineyards have been re-established. An expansion of the shopping centre in Pioneer Road, Waurn Ponds, in 2014 on a 6.5 hectare site, more than doubled the size of the centre.